MS SQL Server Database Activity Monitoring solution by DataSunrise provides continuous monitoring and recording trails of all user transactions in multiple databases, giving the ability to identify illegal, fraudulent or other undesirable behavior. Cybercrime investigation can be made without proper log files. Activity monitoring is a sufficient component of the corporate security system. 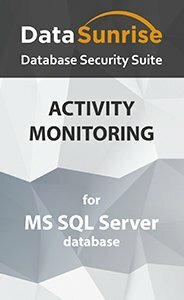 MS SQL Server Database Activity Monitoring solution by DataSunrise examines and collects information about transactions executed in a corporate network. Our product makes it easy to manage a number of databases, showing queries of common and privileged users and identifying potentially dangerous operations. The MS SQL Server Database Activity Monitoring rules are flexible and can be customized for various requirements. The program is easy to deploy and causes no performance downtime. It is not common that a company doesn’t even know about a data leak. With a comprehensive MS SQL Server monitoring tool, you always know who and when executed a certain transaction. If someone copied sensitive data to hardware, you will see the action in the logs and take measures to prevent further distribution. Moreover, it analyzes typical user operations and alerts if there is a case of a suspicious activity, which gives the opportunity to react to attacks on time. Notifications can be set to trigger certain security or audit rules simplifying the work of administrators. System events: security policy update, configuration changes, group profile modifications, configuration changes. MS SQL Server Database Activity Monitoring tools leave no opportunity for evildoers to hide traces of their activity, as logs with results of monitoring are stored in outsourced database or transferred to SIEM system, which gives real-time analysis of security alerts. DataSunrise Database Activity Monitoring for MS SQL Server helps to comply PCI DSS, SOX, HIPAA and other standards.